These are used to replace a missing tooth. Bridges are supported by the teeth on either side called abutment teeth. 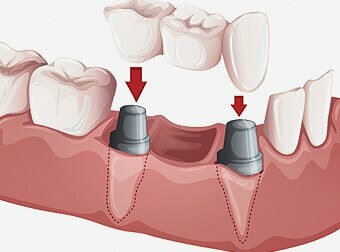 Both crowns and most bridges are fixed prosthetic devices cemented onto existing teeth or implants. Bridges can be used to replace a gap between a single missing tooth or many teeth. Cantilever bridges are used to replace a tooth that does not have supporting teeth on both sides or for front teeth. A bridge can lose its support if the teeth or bone holding it in place are damaged by dental disease. Keep your gums and teeth healthy by Brushing with fluoride toothpaste twice a day and flossing daily. Also see your dentist and hygienist regularly for check-ups and professional cleanings. Q: How many clinic visits will I need to get crowns or bridges? A: It depends on the number of crowns you need. You will have to come 3 times to the clinic in that same week.